SUMMER CAMP 2019 - Learn. Invent. Lead. Coding &Tech. Science & Engineering. Morning: Code a Game or an App, Fly Drones in the open field. Eat Lunch in the outdoor shed, picnic style. Laugh. Play. Get the Sun. Afternoon: Hands on Science Experiments - make electricity, Play Dodgeball outside, Blast actual rockets in the air and learn rocket science. Get better at Public Speaking. A true medley of excitement and learning, unique options you will not find anywhere else in Charlotte!!! Our camps are all about a healthy combination of fun and learning in the summer. Campers look forward to each day of learning with eagerness and excitement. Coding & Tech: Virtual Reality applications, 3D printing, High School programs in AP Computer Science, Artificial Intelligence & Machine Learning plus all new games and apps. Entrepreneurship: A greater focus on learning how to build highly responsive professional company web sites, in addition the usual exciting startup journey. Science Innovations: Units on environmental science, heavy duty bottle rockets that go up hundreds of feet, advanced (but safe) biology experiments. Engineering & Machines: Roller Coaster designs, hydraulics & pneumatics. In addition to our rich camp content, during breaks we take our campers outside on grassy fields and get sunlight while we play fun games like dodge ball, beach-ball and even fly mini drones. We sometimes have picnic style lunches outside (under a shade). Never a dull moment in our summer camps. We make learning fun and promise tons of smiles!! Public Speaking & Oratory: Impromptu/Original Oratory/ Humorous. Will also be available online - live teacher run. 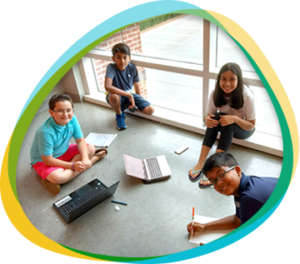 All our technology camps are customized for Beginners and Advanced programmers with a variety of challenges based on prior programming experience of campers...each week has new programs and challenges so repeat campers will get all new materials every week. Campers will live an action packed journey of entrepreneurship as they learn advanced web development skills and build a responsive company website highlighting their product or service innovation. They will build advertising campaigns, design their organization structure and build their first cash flow and profit&loss spreadsheet. They will also launch an actual live marketing campaign to raise money for a local charity. Students will learn the art of cold calling and after researching the charity and the supported cause they will launch an actual social media and calling campaign to raise money the cause. On the final day, Campers will present their business to their peers highlighting their creative product or service innovation including all associated aspects of Marketing, Operations, Finance and People strategies. Campers build games, animations and applications using MIT's Scratch platform and see creations come to life immediately in front of their eyes. 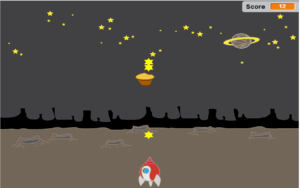 Campers will build a myriad of different games from Space pursuits to Wizard battles.... Innovative Ball games to logic puzzles using the simple yet amazingly powerful Scratch Platform. Challenges to keep both Beginner and Advanced programmers engaged and learning. Advanced: Our Advanced Scratch program boasts a highly engaging curriculum designed for experienced programmers. If you think Scratch is just simple block coding, think again. In the Advanced Game Programming curriculum, your experienced programmer child will learn many sophisticated algorithms to build ultimate challenging games like the Harry Potter Wizarding battle, the Wingardium Leviosa where you cast custom spells based on custom waves of the wand and much more. A great program to learn advanced Game Design logic in a very comfortable platform designed by MIT. Campers learn HTML and Rapid Development tools to build a fully functioning and live website with multi page navigation, embedded pictures, videos, links to internal and external pages etc. They will learn all the basic skills needed to be able to build any kind of website in the future with many practical uses (like organizing their study links, managing calendars and events to share with parents etc). Advanced: Advanced students will branch out into learning and applying Cascading Style Sheets in their website. 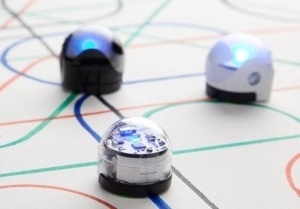 Program light and color sensing Ozobots to solve multiple fun challenges. 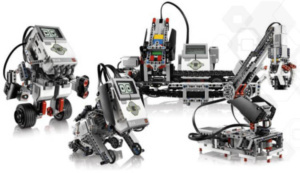 Program many logical challenges with the Lego EV3 Mindstorm integrating multiple sensors and motors. A free form camp for beginners and advanced programmers to learn the fundamentals and complex algorithms of robotics and developing innovative movements, applications and solutions to challenges. Campers can expect challenges they have never seen before that can only be solved using their keen Vulcan sense of logic and programming prowess. When code interacts with moving mechanical part of a robot there is invariable a loss of efficiency. Your child will learn advanced programming techniques to minimize efficiency loss and increase effectiveness of the robot in completing tasks and challenges. Prepare to be amazed with this unique and most prolific Robotics camp, you will not find the likes of anywhere else. Campers design and develop fully functional mobile apps and games that they can install on their phones plus share with family and friends. Using simple yet powerful tools, campers proudly design and develop fully functional Android apps. They will amaze you with their creativity in this program that has campers building all new apps at both beginner and advanced levels. Students will become self sufficient in building apps and various inbuilt phone sensors like accelerometer, orientation sensor, GPS, camera etc. Our students have branched out to win many coding competitions and published apps on the app store. Your child will come out of this camp with sufficient exposure and knowledge to continue their journey independently and build many mobile apps with practical use. 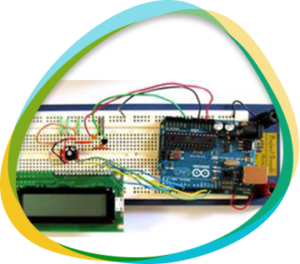 Rising Grades 5+: Design and Configure fully functioning electronic circuits on Arduino and program using the all powerful C language to make functioning prototypes of consumer utility products and games. Rising Grades 1- 4: Design fully functioning electronic circuits while learning the fundamentals of coding using logic blocks. Not only will campers get exposure to Science and Technology but will apply their creativity as they apply the fundamentals of electronics in designing practical circuits. Campers learn one of the most popular professional programming platforms today as they develop Games and Applications using Python. This is a beginner friendly camp for students in rising grades 6 and up, but also suitable for rising 5th graders with prior programming experience. Campers will start their journey on one of the most prolific computer programming platforms that are used by professionals in many industries as they design many graphic games and applications. Campers pour their imagination into their creative work of fiction while building an animated movie using MITs Scratch programming platform. 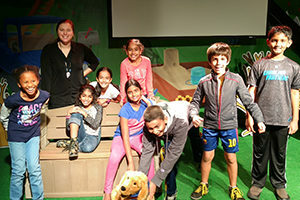 They learn about the nuances of computer graphics and creating movements, special effects and smooth story lines using the Scratch platform. Humor, Sci-fi, Animal Kingdom...possibilities are endless. A unique camp combining Computer Programming, Storytelling and Film making. The ultimate game development platform. Campers will build simple but high-quality 3D games in Unity and C-Sharp, that can be installed and played across mobile devices, desktop or the web. 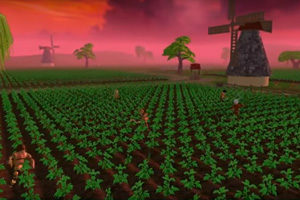 This is one of the most popular platform to build 3D games. Complete package to build games with cutting edge cinematic graphics, animations and rich functional integrations. Campers will also learn the essentials of a Virtual Reality application and associated coding techniques. It will be fascinating!! AP+ Computer Science with Java. Read more HERE. This unique program will mirror the content covered in the first two years of Computer Science Undergrad, while maintaining an appropriate pace of instruction that will be manageable by students in high school. Starting with the content of AP Computer Science (High School), the curriculum will then take students into depths of object oriented programming, algorithms, data structures and more, transforming them into early computer scientists. They will cover many topics taught in Computer Science undergrad which will give them an edge in the college application process plus a significant advantage over peers when they actually set foot into college. Coding is just a small part of Computer Science and this program will take students deep into areas of computer science and engineering like algorithm analysis, performance optimization etc. Truly mirroring what is taught in Computer Science undergrad. We have developed this program in partnership with Computer Science professors from some of the top universities in the country. Students required to have at least 12 months of prior programming experience, designed for students in Grades 9 or higher. Artificial Intelligence and Machine Learning with Python. Read more HERE. This is a course designed for your child in Grades 9 or higher who is demonstrating immense passion for technology and computer science. A unique course to give students an early introduction to the fundamentals of Machine Learning and Artificial Intelligence, the breakthrough advancements in the field of Data Science. Students will code in Python and apply statistical concepts to pattern recognition and build self learning prediction and classification models. The pacing of the course assumes no prior experience with the topic and will patiently go deep into the cutting edge domain of Artificial Intelligence and Machine Learning. Content covered is usually taught in undergrad Computer Science. Creativity should be unbridled. This camp will bring out the creative builder in your child with gears, pulleys, motorized movements for campers to create working prototypes of moving robots, machines, innovative vehicles and much more. Campers will learn the basics of engineering components and motions, transforming between different degrees of motion and then apply those concepts to design and build innovative structures and vehicles. 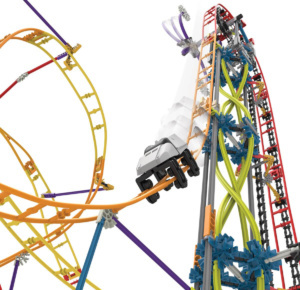 Design and build physical roller coaster tracks and learn about forces & motion and energy transfer, friction and eddy current brakes. Did you know why roller coaster loops are not fully circular? In addition, campers will also design virtual roller coasters and visualize their constructed ride in 3D Virtual Reality. Build past bridges to maximize load carrying efficiency. Did you know there's a way to figure out which elements of a bridge are under compression vs tension and why is it important to know? Build innovative vehicles that work on storing potential energy and converting to kinetic. Do you know the relationship between how force translates to motion based on diameter of the wheel? Our campers will thrive in our inquiry based learning environment where they will be encourage to ask WHY's, HOW's , WHAT-IF's as they channel their curiosity into engineering design and learning. A science program like none other. Campers will learn many science concepts that they often take for granted while conducting safe experiments to enhance their learning journey of curiosity and exploration. A program designed by STEM professionals, it's a innovative combination of experimentation based learning, collaborative discussions and asking a whole bunch of WHY's, HOW's, WHAT-IF's. If you have a curious child, our Science camp will lead them into a fantastic learning journey. Give your child a significant head start to the next school year with our camps that are designed to stimulate creative thinking, fun and learning by building skills and strategies on Math problem solving and Creative Writing. Our Math camp is unique and innovative...like none other your child has experienced...it's really a problem solving camp. Your child will be in highly engaging classrooms, developing problem solving fundamentals and Math Olympiad strategies, developing critical thinking skills along the way. This is not a camp where your child will get bored with repetition, quite the contrary!!!. Our Math camp is one that campers look forward to every day, filled with logical and creative challenges to excite their fertile minds. In the Creative Writing program, campers will swim through the imagination filled world of creative writing on a variety of topics. Students will create works of fiction, poetry, argumentative pieces as they learn intricacies of planning, superior language style and develop effective and creative written communication skills. Every week, the topics will be different. The variety of our programs are designed to keep campers challenged whether they attend one or multiple weeks. Weeks of July 29, Aug 5, Aug 12: We will gear up your child for their upcoming school year and advance them in Math and Reading to give them a significant advantage when they re-start school. Students will develop the great habits and strategies of timed eye contact, projection, effective body language, art of inflection and enunciation. They will develop the art of organizing and pacing their thoughts in a more effective delivery. Students will act as the UN representatives of a particular country as they research and present their country's case on a pertient issue that is relevant for the country they represent. They will need to develop negotiation strategies and deliver influential speeches to present their case and get the best possible outcome for their country. Students will review a factual legal case and prepare their trial strategy either as the prosecution or the defense. They will role play a witness, lead prosecutor, defense attorney etc as they work with their team to win the case for their client. Have your child get an early start in developing their command over speech, the confidence to stand in front of a crowd and lead the journey of mastering one of the most important skills in life. A custom and age appropriate escape room game where students have to put on their best logical thinking and problem solving hat to crack codes, interpret clues and work as a team to chart their escape from the room. There will be locks to open, treasures to hunt, code to write and even interact with robots to get to freedom. Our escape room will challenge campers to take risks, think outside the box while sitting in a box (hmmm....). We will rock your creative world with this rocking new camp!! Artificial Intelligence + Machine Learning (wk of July 1st): $209. AP Computer Science plus with Java (wk of July 15): $249.